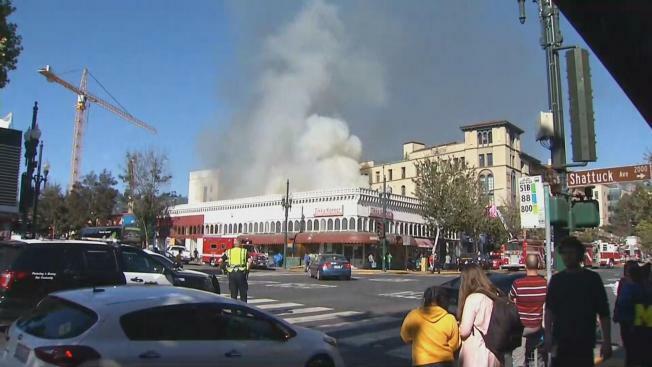 Firefighters battled a two-alarm fire in downtown Berkeley Saturday afternoon. Wood and pallets caught fire around 3:45 in the 2100 block of University Avenue before the flames spread into two nearby businesses, Donna McCracken, Deputy Fire Chief from the Berkeley Fire Department, said. Those exterior flames were knocked down approximately two hours after igniting, but fire crews stayed on scene and worked to extinguish hidden flames flaring up within the interiors of nearby buildings. An apartment complex located on 2119 University Avenue near the engulfed building was evacuated by the Berkeley Police Department as a precautionary manner, McCracken said. "There were just a bunch of flames on the roof right next to us," said eyewitness and apartment resident Andrew Page. "It was pretty scary seeing all the smoke and everything." McCracken is unsure how the fire started and only one firefighter suffered a minor injury. The buildings that were damaged by the fire were mostly vacant and slated to be transformed into apartments in the near future.